Home / Dog behaviour / Experts decode what your pet is really trying to tell you. Experts decode what your pet is really trying to tell you. Barking, whining or growling are all ways for dogs to get their message across. 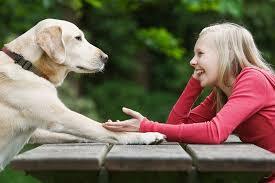 Now scientists say they have “strong evidence” that man’s best friend also uses gestures to communicate with us. One of the first systematic attempts to decode canine language has been conducted by the University of Salford. Researchers signed up 37 dogs, whose owners filmed their everyday movements for the team to analyse. Rolling over, lifting paws and jumping were among the 19 gestures examined. Asking to be scratched, for a door to be opened, a toy to be fetched and for meals to be served were some of the requests the scientists believe they were making. Unsurprisingly, dogs have many ways of indicating they want food -including jumping, turning their head, lifting a paw, rubbing their nose and licking. The study, published in the journal Animal Cognition, also said different dogs use different signals for the same request. For example, a dog might roll on their back or nose their owner’s leg when asking for their tummy to be scratched. The most-used gesture was the ‘head turn’ when the dog looks from a human to an object – usually their food bowl – to show they are interested in it.